Number 5: Ok, so this wasn't actually IN space, but it is a great step forward for the Ares-I Launch Vehicle (which, I worked on this summer!). Also, it involves Orbital, which I worked for last summer :-) This was a test of the escape system to be used on the Ares-I rocket...basically it is the very tip top of the rocket! Sept. 4, 2009 -- Technicians from ATA Engineering Inc. assess data collected during the ground vibration test of the Orion Launch Abort System. 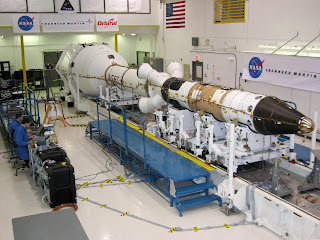 The 53-foot-long inert assembly was tested at Orbital Sciences Corporation's facility in Dulles, Va. Number 4: Wow! It is amazing to me that we have satellites that can show us information like the picture below. 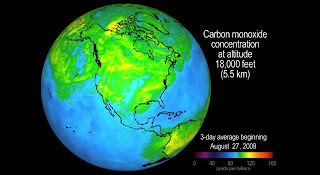 The Aqua satellite was able to make this graphic showing the carbon monoxide levels in the atmosphere from the California wildfires! Incredible! Beginning August 26, 2009, and continuing into September 2009, a large wildfire in the Angeles National Forest north of Los Angeles known as the Station Fire burned more than 140,000 acres through September 3. Carbon monoxide in the smoke from this large fire was lofted as high as 8.3 kilometers (27,000 feet) into the atmosphere, where it was observed by JPL's Atmospheric Infrared Sounder (AIRS) instrument onboard NASA's Aqua satellite. 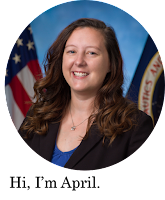 Number 3: Remember STS-128? Well it was just launched a week ago! And look at what they have already accomplished! 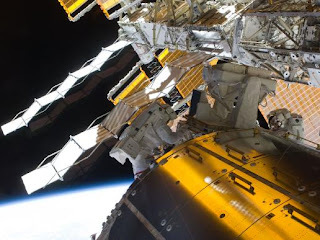 Their third spacewalk will take place tomorrow. Go Discovery!! Number 2: Remember the Lunar Reconnaissance Orbiter? In case you don't (lets be honest, y'all probably aren't quite as nerdy as me!) it was launched this summer while I was in Alabama and is equipped with some super awesome cameras! 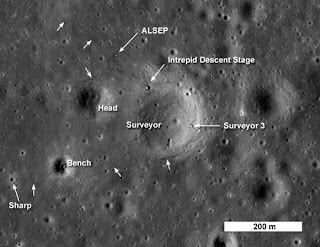 Well just this week they announced that LRO has taken pictures of the Apollo 12 landing site. NASA's description of the picture below will give you more information! Number 1: There is just nothing better than a gorgeous space picture! 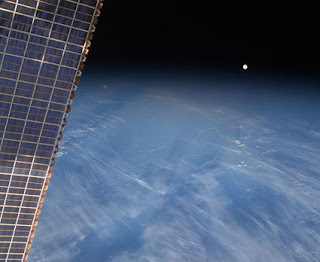 The picture below was taken this week from the International Space Station and shows a full moon in the background. Seriously, this picture is breath-taking! Enjoy...and have a great long weekend!! !